My Chow is two and a half years old and unfortunately hasn't had many opportunities to socialise with babies/children. When a close friend of mine had a baby it gave my Chow and I a chance to see how he got on! He didn't take too much notice of the baby - only lovingly laid next to her when she cried. Now she's starting to crawl which seems to have confused him. He will sometimes bark at her if she's crawling along the floor (not an aggressive bark, more of a playful one!). Obviously i would never leave the two together unattended, but never-the-less, it does worry me slightly. My partner and I have spoken about starting a family ourselves and I so desperately want my Chow to get on with babies. He is my furry baby after all! I was hoping that if my Chow spent day to day socialising with our own baby that he would get used to it quite quickly? Has anyone had a similar experience? 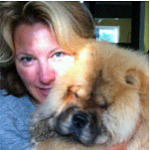 Or advise on how to get my Chow used to babies and smaller children? I think it is doable even with two year old chows. I have known someone have a baby but had chowdrens. Be cautious always, put gates between the baby and the chow. Don't leave them alone unattended. Soon in 5-6 years time when the baby grows at that age, they would get along. Do not throw caution in the air even if you see your chow behaving with the baby. Dogs are dogs and they react to threats very different from us. They use their teeth so keep an eye always. Do you have any suggestions as to how I should introduce the baby and my Chow? The dog should not be allowed to go near the baby until about 18 months. You can even if the baby is 8 months only, IF you are carrying the baby but only for seeing and not for touching or sniffing (face to face) as I deemed it not necessary. The chow can smell the baby's feet. The dog will get used to the baby's smell and would later accept the baby as a family member. I introduce my daughters when they can sit on the stroller and hold unto the rails. or until they can start walking which can be as early as 12 months. But the dog must be supervised. If the tail ducks, stop it. If the dog went away , don't let the toddler chase after the dog. Best indicator is see if the tail is wagging. that's a good sign. If the tail is not moving at all, then be alert. If it ducks, that's not good. Give it another time. It goes without saying that you should always supervise any dog and baby. Our chow, Loki, was already 9 years old when my daughter had our first grandson. They spend a great deal of time with us so I was concerned as Loki had never been with a baby. The first,thing we did was bring home a blanket our grandson had. We let Loki smell it. On our grandson's first visit my daughter unwrapped him and let Loki sniff him from his toes to his head. When he had finished, he simply licked him on the forehead and walked away. Done...he accepted him into the pack. Every time our daughter came for a visit she had to lean over and Loki licked the baby's head. When the baby cried Loki would run to his room and sit by the crib. we lost Loki this summer when our grandson was 4. He misses Loki so much and talks of him often. We rescued another chow just a month ago. He and our grandson are already friends! Some of you scare the crap out of us. Chows are great with kids, plenty of our neighbours agree. Some kids do rub them the wrong way and Chows usually just stay away from them. FuShiLu likes some really dislikes others and some are rough with her, she seems to prefer them. ShenLung ignores them all. When FengHuang was alive she loved all kids and loved babies, especially when they tried to walk as she helped them. She even used to grab their diapers to steady them. Nice replies Cam (long time no see, good to hear from you) and Ski. Those are responsible responses. Of course many dogs,, and yes even Chows have no issues with Children. But it is always good to be responsible. Sane people don't leave infants or toddlers unattended under any circumstances, and certainly not with an unfamiliar dog. As for that other response, that is just ridiculous. "Some kids do rub them the wrong way and Chows usually just stay away from them. FuShiLu likes some really dislikes others and some are rough with her" is irresponsible. Usually is not good enough when you are talking about a dog that could kill an infant within 15 seconds. Whether you think that scares some people or not is irrelevant. Caution is always a better approach than cavalier indifference. I am sure your neighbors will continue to agree until one of those neighbor kids rubs a dog the wrong way and is mauled because it wasn't on of those 'usual' times. Its a great reassurance to hear that you've had positive experiences between Chow and babies. I will definitely try to introduce the babies blanket first. That sounds like a great idea! I agree that neither children or adults should be rough with any dog. All dogs have a certain level of unpredictability! My chow hates anyone that comes at him too quickly or from behind where his vision doesn't allow him to see them! The only people he will play fight with it myself and my partner. Children sometimes get carried away or could even accidentally poke the dog in the eye, which I'm sure would anger any animal. Sorry to scare some of you but I was just stating a possibility. I have dogs all my life and have kids too and it scares me more to see a video of a growling dog while being petted by a toddler and the adults are laughing in the background and letting the child do touching hugging the canine while the dog is visibly upset, growling from the belly and holding back. The adults said innocently that the dog actually "liked" the child by growling. Hi Rory's dad! Nice to be back and share experiences here with newbies. Of course if you are stupid enough to laugh when a dog growls at a child you are an idiot and you probably shouldn't even have a dog, or a child for that matter. I have had 5 Chows now in the past 30 years and I've had two that I would trust 100% even with a baby. My boy Brisco who past away last year never hurt a living thing. He wouldn't even protect himself when attacked by other dogs. There is no way that he would have ever hurt a child no matter what it did to him, period. I've had others that I wouldn't trust around infants but were fine with children. I also had 1 that nobody could pet without me being there and then most people didn't want to, he just wasn't very nice. Cam Atis, There is NO reason that you would need to wait until a child was 18 months to let your dog near them, ridiculous. 5 or 6 years before your dog would get along with your child? Crazy! these numbers are so random. It's all about the dog and socialising them as early as possible. Someone should know there own dog well enough to know if it's going to be aggressive toward or hurt their child, And if you did think that there was even a chance of it, you should rehome your dog. I've got photos of my Chows face to face, even licking the forehead of a 3 month old. I'm not saying leave your baby unattended with your dog but Why would anyone keep a dog in a house with your children if you thought it was dangerous??? I agree with Brisco. A lot can be said about the temperament and socializing of a chow. 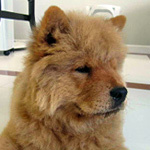 I trust my male chow 100% with children, babies and small animals. He is mildly curious and extremely gentle. People often let their small children love all over him. No issues... A child once reached too quickly to pet him and poked him in the eye. He merely backed up and looked at me for reassurance. We let the child try again more slowly and everything was cool. That being said I do not leave him unattended with small children or babies. My 5 year nephew uses him for a pillow when watching tv, but I am still in the room. They are probably fine... I am just cautious. My puppy is still too mouthy to play with small children as she wants to catch them and she gets nippy when worked up. She is fine when children are sitting quietly on the floor and will lay nicely and let them give her belly rubs. My rottweiler (scary beast) is awesome with babies and toddlers. He does try to put his nose under their arm to lift them up when they fall. I closely watch body language and intervene at the first sign of stress. I agree with previous posters about knowing your dog and the individual child. This is just my experience with my dog. Moose was 13months old when I brought my son home from the hospital. He is absolutely amazing with my son. Very gentle and protective. We tried to introduce him to lots of children and babies before we had our son. So it's good that you are socializing your chow already with kiddies. I had read about bringing a blanket home from the hospital and was planning to do that too. But with a very long delivery and then a short hospital stay that didn't end up happening. First, when I got home, I made sure to give Moose lots of loving since I was away overnight. Then I introduced my son. Moose has been taught the command "gentle" as a pup. So I held my son and sat on the floor and allowed Moose to sniff him starting with his feet, bum and back. I said the word "gentle" and praised him lots. All future times whenever I held my son and Moose came over, I always allowed Moose to sniff him and repeated the word "gentle" with lots of praise. Moose would always come over when my son was doing tummy time to investigate and also lie down next to him. I was okay with this as Moose had shown that he is very gentle with my son. He would lick his feet and his back sometimes, but mostly he just wanted to lie next to him. A few times I could see him going towards sniff/lick my son's face/head area and I would say no. He would always stop right away. I know some people allow their dogs to do this, but I don't feel comfortable with the germs so I don't want Moose to get that habit. Plus it is probably safer that way. I always supervise them when they are together! Moose has shown that he is very gentle and loving towards my son, but I would rather be safe than sorry. In terms of Moose with other children. I am even more cautious as children can be unpredictable. Again, always under my supervision and I actually make sure I am right next to Moose. I always start by telling the kids to be gentle. I tell Moose to be gentle too. Moose has always liked babies and children. Even though he is shy towards strangers he has always allowed children to pet him and approach him. However, he does not like it when they scream, run towards him or flail there arms. This has happened a couple times in public. At those times, I stood between the child and my dog. And then I remove Moose from the situation. All the parents I have come in contact with have not been offended by this and very understanding. It's a good opportunity to tell parents/children that they should be cautious around dogs. Hope this helps! Don't be scared. The fact that you are already thinking and planning for this is awesome. That's a good point Mother Moose. The dog may be absolutely socialized, trained, and perfectly well tempered. But you never know what's going to happen with a child. A startling movement, a quick screech in excitement of seeing a pretty dog, or a misplaced finger or arm. I think we can agree that the situation requires monitoring...of both the dog and the child. My 2 year old smooth is as sweet as they get. Never would intentionally hurt a soul. But he lives in a house with 2 other chows and he likes affection. If he feels he is getting the short end of attention he VERY Gently nibbles to get your attention. Not even close to aggressive or mean spirited, just the way he communicates at times. For adults and older children, no big deal, but if he were to try to get the attention of a younger child it probably could break the skin. For that reason, I always monitor and instruct. Toby (the dog), gets a solid command to stand at attention, and the child is taught how to properly approach and pat him.